Kirthevasan Kandasamy, Jeff Schneider and Barnabás Póczos received the Distinguished Paper Award at the 24th International Joint Conference on Artificial Intelligence (IJCAI) for their paper "Bayesian Active Learning for Posterior Estimation." Out of a record breaking 1,996 paper submissions with 575 accepted papers, this was one of two papers to receive the award. 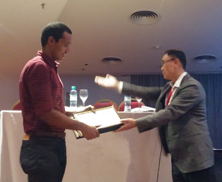 The award was presented in Buenos Aires, Argentina during the IJCAI-15 Conference. Scientists frequently encounter the problem of estimating important scientific quantities such as the Hubble constant or the amount of dark matter in the Universe. They have developed simulators which can be used to assess if any particular value for these quantities is plausible. However, these simulations are very expensive and it is impossible to exhaustively simulate all possible values for these quantities. Consequently scientists may miss interesting new theories. This research is about algorithms to automatically make smart decisions about which values and theories to test. This work enables scientists to intelligently explore theories and potentially enables them to make new discoveries that might otherwise go unnoticed. Read the full abstract below. Abstract: This paper studies active posterior estimation in a Bayesian setting when the likelihood is expensive to evaluate. Existing techniques for posterior estimation are based on generating samples representative of the posterior. Such methods do not consider efficiency in terms of likelihood evaluations. In order to be query efficient we treat posterior estimation in an active regression framework. We propose two myopic query strategies to choose where to evaluate the likelihood and implement them using Gaussian processes. Via experiments on a series of synthetic and real examples we demonstrate that our approach is significantly more query efficient than existing techniques and other heuristics for posterior estimation.